Dogecoin is a peer to peer, decentralized digital currency that allows easier money transactions online. 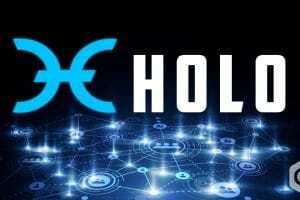 Though introduced as a joke currency, it became popular and significant in the crypto world within a short period of time due to its service as a tipping system on Reddit and Twitter. 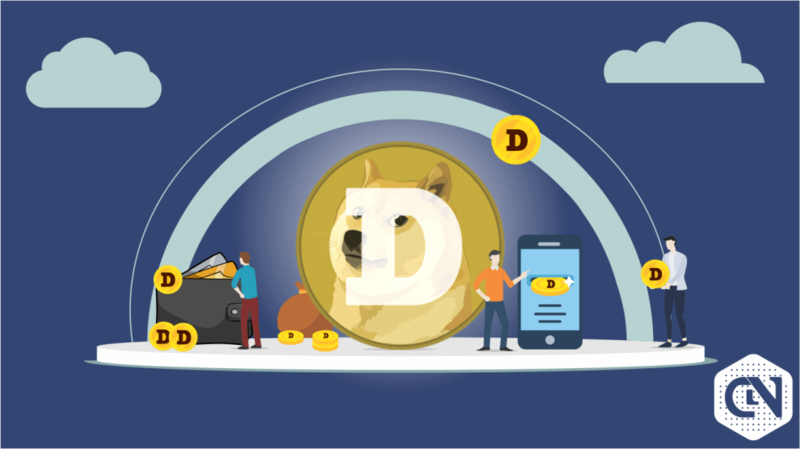 Dogecoin was launched in 2013 and is still a famous cryptocurrency in 2019 and have achieved legitimacy and credibility that other coins don’t have. 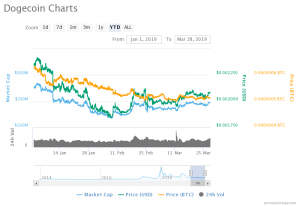 According to the coin market cap, the mcap value traded at USD 247,238,581 in the opening of March 28 at 07:34 UTC. And the coin’s price traded at 0.002081 USD. The market cap value ranks the cryptocurrency as the 27th largest in the market. 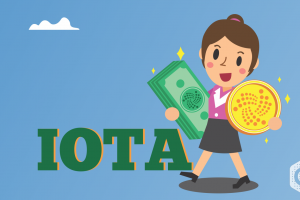 This rank is also influenced by the circulating supply of 118,835,574,213 DOGE coins. 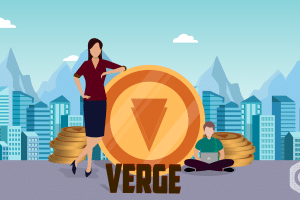 The current value at which the cryptocurrency is trading of USD 248,030,779 (09:34 UTC) and the price per coin sums up to 0.002087 USD. The overall market has been on the rise with the current value higher than its all-time low on February 08 of USD 217,514,252 (08:34 UTC) by 14.03%. 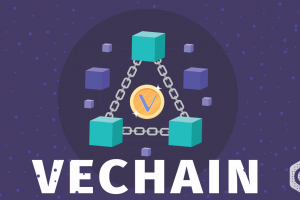 The cryptocurrency reached its peak value when the currency improvised from its drown trend period and reached a value of USD 250,677,061 on February 24 at 13:34 UTC. The growth in the market is proved by the increase in moving average from March 07 with the value of USD 237,654,690 to the current value. The increasing market trend gives the bulls the upper hand. The rise in pricing values offers good support resistance. The Crypto Ground predicts that the price of Doge coins will see an improvement in the future with values increasing to 0.0032 USD by the end of 2019. It also estimates the amount will grow up to 0.0119 USD in 5 years. Similar to the previous analysis, the wallet investor’s technical analysis also predicts a better future for the cryptocurrency with the values increasing by 80.16% and reaching a price of 0.00376 USD by the end of 2019. The current linear values of the trading price are estimated to increase by the upcoming months. The five-year prediction also turns out to give a positive outcome for the cryptocurrency with the trading price spiking to 0.00868 USD by 2024. Recently, Dogecoin has been adopted as payment for goods and services by various online stores. This would increase the demand for the digital currency, and this would lead the currency to an optimistic future. 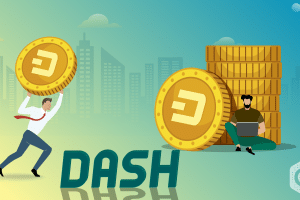 Coin switch concludes that this recent addition would increase the trading price by a minimum of half a cent in a couple of months and reach the highest of 0.0147 USD in the mid of 2019. 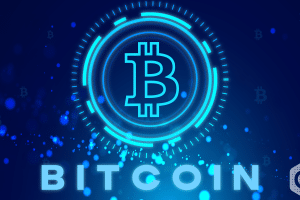 The key feature of the cryptocurrency might increase the value between 0.00936 and 0.01 USD by the end of 2019. Dogecoin’s present market looks reliable for buyers. The market trend is stable with a moderate increase in values. The bulls rule is advantageous for steady growth. The short term investors are the major source for a boost in pricing values. Their routine contributions will give rise the value drastically in the future. The predictions can be made to reality with these investments. Long term investors also find this market suitable for them as the future foresees a positive outcome.